At just 2-3/8 inches long when folded, the Tiny Trapper weighs only one ounce. That's light enough to compete with ultralight emergency knives built to much lower standards. Strong nickel silver bolsters brace both ends of the knife handle, and panels of natural India stag horn provide a durable gripping surface. The knife uses slip-joint construction, holding blades securely in both open and closed positions through steel spring-bar tension. Neither blade locks when open, so be cautious when applying piercing pressure -- pressing on the back of the blade closes the knife. Trapper knives contain two blades which pivot from the smaller end of the handle. Originally designed for hunters and trappers, the knife offers clip point and spey point blades of equal size. The clip point pierces and carves, while the spey point is best at shallow cuts and controlled slicing. The raindrop Damascus high carbon steel blades of the Tiny Trapper were created from steel stock specially forged at Devin Thomas Damascus. Thomas developed a total of 15 unique damascus patterns, only one of which was chosen for Case knives. The raindrop pattern results from controlled hammer blows on the hot steel, distorting the layered metal in precise geometric designs. 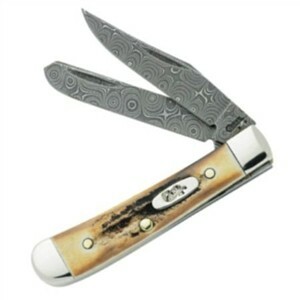 If you need a larger knife, the Case Stag Trapperlock adds lockback safety to this very popular outdoorsman's knife.